This article is about philosophical region in Indian religions. For other uses, see Jambudvipa (disambiguation). Jambudvīpa (Sanskrit: जम्बुद्वीप) is the dvipa ("island" or "continent") of the terrestrial world, as envisioned in the cosmologies of Hinduism, Buddhism, and Jainism, which is the realm where ordinary human beings live. 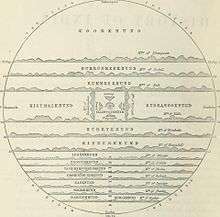 According to Puranic cosmography, the entire Cosmos is divided into seven concentric island continents (sapta-dvipa vasumati) separated by the seven encircling oceans, each double the size of the preceding one (going out from within). The seven continents of the Puranas are stated as Jambudvipa, Plaksadvipa, Salmalidvipa, Kusadvipa, Krouncadvipa, Sakadvipa, and Pushkaradvipa. Seven intermediate oceans consist of salt-water, sugarcane juice, wine, ghee, curd, milk and water respectively. The common names of the dvīpas, having their varṣas (9 for Jambu-dvīpa, 7 for the other dvīpas) with a mountain and a river in each varṣa, is given in several Purāṇas . There is a distinct set of names provides, however, in other Purāṇas . The most detailed geography is that described in the Vāyu Purāṇa . The Buddhist cosmology divides the bhūmaṇḍala (circle of the earth) into three separate levels: Kāmadhātu (Desire realm), Rūpadhātu (Form realm), and Ārūpyadhātu (Formless realm). In the Kāmadhātu is located Mount Sumeru which is said to be surrounded by four island-continents. "The southernmost island is called Jambudvīpa". The other three continents of Buddhist accounts around Sumeru are not accessible to humans from Jambudvīpa. Jambudvīpa is shaped like a triangle with a blunted point facing south. In its center is a gigantic Jambu tree from which the continent takes its name, meaning "Jambu Island". Mount Meru is at the centre of the world surrounded by Jambūdvīpa, in form of a circle forming a diameter of 100,000 yojanas. 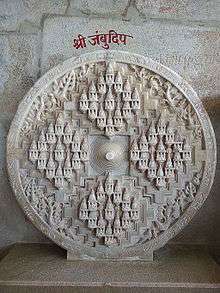 Jambudweep Jain tirtha in Hastinapur, constructed under supervision of Gyanmati Mataji, is a depiction of Jambudvipa as per Jain cosmology. ↑ "Jambudwipa: The Seeds Of Political Unity In The Indian Subcontinent".